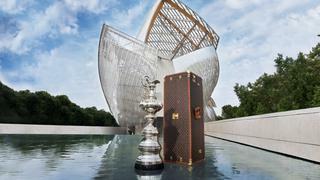 Following last month’s announcement that Louis Vuitton would be honouring its historic links to the America’s Cup by becoming the 2017 title partner, the French luxury brand has unveiled a bespoke case designed to house the coveted trophy. Crafted in the style of the brand’s iconic luggage, the case is made from Louis Vuitton’s signature brown and gold monogram leather and finished with brass appointments, providing a fitting home for the world’s oldest sporting trophy. Six teams will battle it out to win this treasured prize at the 2017 Cup in Bermuda, including Britain’s Ben Ainslie Racing and a new challenge from Team Japan. Louis Vuitton have good form in the sporting arena, having also created a similar trophy case for the FIFA World Cup 2014, which was presented to winning nation Germany by Brazilian supermodel Gisele Bundchen. Louis Vuitton’s sponsorship of the 35th America’s Cup will include title partnership of the World Series, Qualifiers and Challenger Playoffs as well as being the presenting partner. To celebrate their sponsorship of the 34th America’s Cup the fashion house opened a pop-up shop and exhibition at the end of Pier 27 in San Francisco, where the race was held.